No matter what type of business that you have, when you take on staff, you also assume responsibility to pay them. However, how often and what method you use to pay your team is up to you. You can pay weekly, bi-weekly (every two weeks) or once a month. Some workers want a physical check, but many prefer direct deposit into their bank accounts. Regardless, you’ll need to set up a payment schedule for your workers and decide how that payment will be distributed. The means by which you should structure your payroll depends on local laws and how your business is set up. If, for example, you have hourly employees only (no commissions), you just need to accumulate their hours, multiply by their hourly pay rate and then remove any withholding for federal, state and local income tax, social security tax, and Medicare tax paying the employee the balance. If you have any salaried employees, short of tallying their hours, everything else above applies. Salaried employees are paid a flat, agreed-upon rate per week, month or year and are expected to work a minimum amount of hours usually in a management capacity. For states that allow straight commission workers, you need to come up with a percentage of services that you pay your staff while the salon or spa absorbs the rest. In that case, sales of services need to be tallied and the percentage owed is paid to the operator. Most straight commission beauty businesses offer 50/50 split minus a per-client fee for color or other expenses. That fee usually ranges from $10-20, depending on the service. The debate as to whether or not a commission worker is an employee or independent contractor has raged on for years. Although the definition of an independent contract varies from state to state, there are some fundamental determining factors. If the person works for you on a regular basis, if their position is open-ended, if you have to supervise them in any way, if you dictate the hours that they work, how they do their job for you, or if the worker’s activities are a core part of what your business does, they are employees. If you are unsure if your workers are employees or can indeed be classified as independent contractors, consult with your CPA or attorney to find out. In most states, you have to pay your commission crew minimum wage for your area plus any agreed-upon percentage in commission. In that case, you would likely want to adjust the split to help cover the cost of the minimum wage payment. These workers are considered employees, so withholding is required, and you are obligated to send them a W2 form at the end of the year. In the case of a rental salon or spa, where it’s legal to operate as such, the operators technically pay rent for a given period (usually weekly or every two weeks). However, you may have an agreement with them for you to pay commission on any retail sales. In that case, the renter is classified as an independent contractor and should receive a form 1099 for any retail commission over the minimum at the end of the year. 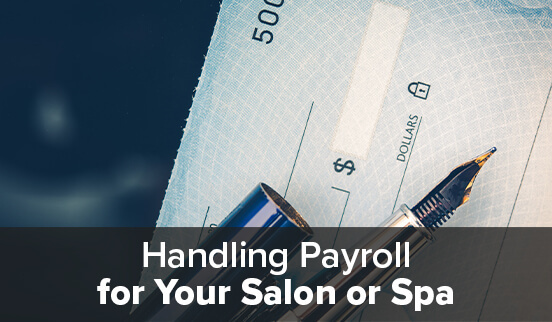 If you are managing a smaller salon or spa, payroll may not be too much of a task for you to handle. However, for larger businesses or if you need to unload some of your owner obligations, either hire a full or part-time bookkeeper, integrate accounting software with a payroll feature or look into a payroll service to help you out. Whether you manage the task of payroll yourself or hire someone else to do it, accounting software is usually a good idea. With this type of application, you can set up a process for adding employees, identifying hourly and commission rates and then plugging in the sales and services for the timeframe needed. From there, the software will identify what withholding needs to happen. You or your bookkeeper will need to set this amount aside into appropriate impound accounts and then disperse the balance to the employee. By law, you need to maintain accounts for all withholding and file accordingly with each agency as they require. Your staff counts on you to pay them on time, so set up the most efficient and affordable process for you to see that your salon or spa payroll is running smoothly.